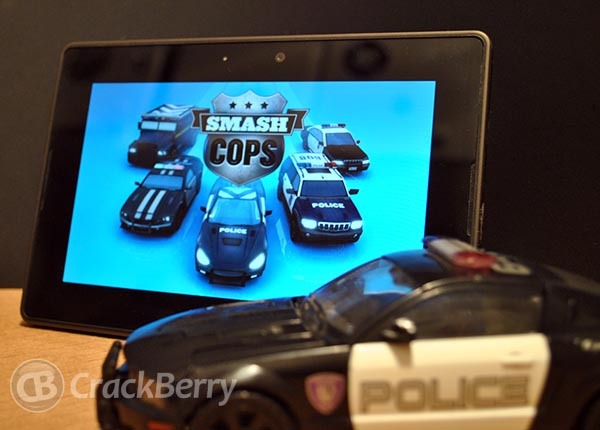 Just this afternoon we we heard that a ton of hot new games were coming to the BlackBerry PlayBook, one of which was Smash Cops from Union. There was a lot of speculation about just when we'd see these games, and lo and behold here is one of them in App World now. Smash Cops is a challenging pursuit game where you drive a police car after runaway bad guys, while avoiding pedestrians, civilian traffic, and other obstacles. Choose from any of 4 mini-games: smash a load of cars illegally parked in a car park, weave through a course laid out by cones, and dodge traffic on a highway and collect evidence throughout the city. Smash Cops uses a different style of control than you normally find in a car/driving type game. Instead of steering by tilting your device or pressing on either side of the screen, you actually place your finger behind the car to steer. It takes a bit of getting used to but it does work well. The graphics are definitely high quality and with different attack and escape routes spread over 20 missions and 5 vehicles you're sure to play this one for some time to come. You can grab Smash Cops for $4.99 at the link below.